The two dreams have the same meaning. HE MEN WHO bought Joseph from his brothers were called Ishmaelites, because they belonged to the family of Ishmael, who, you remember, was the son of Hagar, the servant of Sarah. These men carried Joseph southward over the plain which lies beside the great sea on the west of Canaan; and after many days they brought Joseph to Egypt. How strange it must have seemed to the boy who had lived in tents to see the great river Nile, and the cities thronged with people, and the temples, and the mighty pyramids! 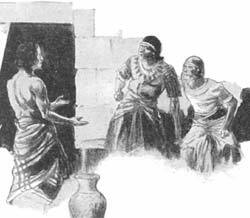 The Ishmaelites sold Joseph as a slave to a man named Potiphar, who was an officer in the army of Pharaoh, the king of Egypt. Joseph was a beautiful boy, and cheerful and willing in his spirit, and able in all that he undertook; so that his master Potiphar became very friendly to him, and after a time, he placed Joseph in charge of his house, and everything in it. For some years Joseph continued in the house of Potiphar, a slave in name, but in reality the master of all his affairs, and ruler over his fellow-servants. But Potiphar's wife, who at first was very friendly to Joseph, afterward became his enemy, because Joseph would not do wrong to please her. She told her husband falsely, that Joseph had done a wicked deed. Her husband believed her, and was very angry at Joseph, and put him in the prison with those who had been sent to that place for breaking the laws of the land. How hard it was for Joseph to be charged with a crime, when he had done no wrong, and to be thrust into a dark prison among wicked people! But Joseph had faith in God, that at some time all would come out right; and in the prison he was cheerful, and kind, and helpful, as he had always been. The keeper of the prison saw that Joseph was not like the other men around him, and he was kind to Joseph. In a very little while, Joseph was placed in charge of all his fellow-prisoners, and took care of them, just as he had taken care of everything in Potiphar's house. The keeper of the prison scarcely looked into the prison at all; for he had confidence in Joseph, that he would be faithful and wise in doing the work given to him. Joseph did right, and served God, and God blessed Joseph in everything. While Joseph was in the prison, two men were sent there by the king of Egypt, because he was displeased with them. One was the king's chief butler, who served the king with wine; the other was the chief baker, who served him with bread. These two men were under Joseph's care; and Joseph waited on them, for they were men of rank. "Why do you look so sad today?" Joseph was cheerful and happy in his spirit; and he wished others to be happy also, even in prison. And one of them said, "Each one of us dreamed last night a very strange dream, and there is no one to tell us what our dreams mean." For in those times, before God gave the Bible to men, he often spoke to men in dreams; and there were wise men who could sometimes tell what the dreams meant. "Tell me," said Joseph, "what your dreams are. Perhaps my God will help me to understand them." Then the chief butler told his dream. He said, "In my dream I saw a grape-vine with three branches; and as I looked, the branches shot out buds; and the buds became blossoms; and the blossoms turned into clusters of ripe grapes. And I picked the grapes, and squeezed their juice into king Pharaoh's cup, and it became wine; and I gave it to king Pharaoh to drink, just as I used to do when I was beside his table." Then Joseph said, "This is what your dream means. The three branches mean three days. In three days, king Pharaoh shall call you out of prison and shall put you back in your place; and you shall stand at his table, and shall give him his wine, as you have given it before. But when you go out of prison, please to remember me, and try to find some way to get me, too, out of this prison. For I was stolen out of the land of Canaan, and sold as a slave; and I have done nothing wrong to deserve being put in this prison. Do speak to the king for me, that I may be set free." "In my dream," said the baker, "there were three baskets of white bread on my head, one above another, and on the topmost basket were all kinds of roasted meat and food for Pharaoh; and the birds came, and ate the food from the baskets on my head." "This is the meaning of your dream, and I am sorry to tell it to you. The three baskets are three days. In three days, by order of the king you shall be lifted up, and hanged upon a tree; and the birds shall eat your flesh from your bones as you are hanging in the air." And it came to pass just as Joseph had said. Three days after that, king Pharaoh sent his officers to the prison. They came and took out both the chief butler and the chief baker. The baker they hung up by his neck to die, and left his body for the birds to pick in pieces. The chief butler they brought back to his old place, where he waited at the king's table, and handed him his wine to drink. You would have supposed that the butler would remember Joseph, who had given him the promise of freedom, and had shown such wisdom. But in his gladness, he forgot all about Joseph. And two full years passed by, while Joseph was still in prison, until he was a man thirty years old. But one night, king Pharaoh himself dreamed a dream--in fact, two dreams in one. And in the morning he sent for all the wise men of Egypt, and told to them his dreams; but there was not a man who could give the meaning of them. And the king was troubled, for he felt that the dreams had some meaning which it was important for him to know. "I do remember my faults this day. Two years ago king Pharaoh was angry with his servants, with me and the chief baker; and he sent us to the prison. While we were in the prison, one night each of us dreamed a dream; and the next day a young man in the prison, a Hebrew from the land of Canaan, told us what our dreams meant; and in three days they came true, just as the young Hebrew had said. I think that if this young man is in the prison still, he could tell the king the meaning of his dreams." You notice that the butler spoke of Joseph as "a Hebrew." The people of Israel, to whom Joseph belonged, were called Hebrews as well as Israelites. The word Hebrew means, "One who crossed over," and it was given to the Israelites because Abraham, their father, had come from a land on the other side of the great river Euphrates, and had crossed over the river on his way to Canaan. "I have dreamed a dream; and there is no one who can tell what it means. And I have been told that you have power to understand dreams and what they mean." "The power is not in me; but God will give Pharaoh a good answer. What is the dream that the king has dreamed?" "In my first dream," said Pharaoh, "I was standing by the river: and I saw seven fat and handsome cows come up from the river to feed in the grass. And while they were feeding, seven other cows followed them up from the river, very thin, and poor, and lean--such miserable creatures as I had never seen before. And the seven lean cows ate up the seven fat cows; and after they had eaten them up, they were as lean and miserable as before. Then I awoke. "And I fell asleep again, and dreamed again. In my second dream, I saw seven heads of grain growing up on one stalk, large, and strong, and good. And then seven heads came up after them, that were thin, and poor, and withered. And the seven thin heads swallowed up the seven good heads; and afterward were as poor and withered as before. "And I told these two dreams to all the wise men, and there is no one who can explain them. Can you tell me what these dreams mean?" "The two dreams have the same meaning. God has been showing to king Pharaoh what he will do in this land. The seven good cows mean seven years, and the seven good heads of grain mean the same seven years. The seven lean cows and the seven thin heads of grain also mean seven years. The good cows and the good grain mean seven years of plenty, and the seven thin cows and thin heads of grain mean seven poor years. There are coming upon the land of Egypt seven years of such plenty as have never been seen; when the fields shall bring greater crops than ever before; and after those years shall come seven years when the fields shall bring no crops at all. And then for seven years there shall be such need, that the years of plenty will be forgotten, for the people will have nothing to eat." "Now, let king Pharaoh find some man who is able and wise, and let him set this man to rule over the land. And during the seven years of plenty, let a part of the crops be put away for the years of need. If this shall be done, then when the years of need come, there will be plenty of food for all the people, and no one will suffer, for all will have enough." And king Pharaoh said to Joseph: "Since God has shown you all this, there is no other man as wise as you. I will appoint you to do this work, and to rule over the land of Egypt. All the people shall be under you; only on the throne of Egypt I will be above you." And Pharaoh took from his own hand the ring which held his seal, and put on Joseph's hand, so that he could sign for the king, and seal in the king's place. And he dressed Joseph in robes of fine linen, and put around his neck a gold chain. And he made Joseph ride in a chariot which was next in rank to his own. And they cried out before Joseph, "Bow the knee." And thus Joseph was ruler over all the land of Egypt.